Is the ruling class too strong to defeat? How can a revolution succeed when our rulers have well-armed and well-manned militaries at their command? THOSE WHO rule will not give up their power peacefully. Try to disrupt one of their events–like meetings of the World Bank and International Monetary Fund–and our rulers are willing to mobilize thousands of cops, shut down half a city and attack with clubs, tear gas and pepper spray. Imagine what they might do in a revolution–if millions of workers attempted to seize control of the factories, mines, hospitals and schools and run them democratically. Perhaps that’s why socialists are often confronted with the question, isn’t the state all-powerful? 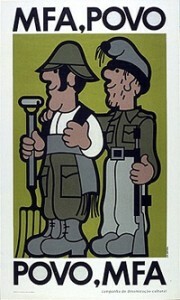 LEFT: Poster produced during the Portuguese Revolution of 1975 (“carnation Revolution”), which saw a great deal of fraternizing between the insurgent military and the civilian population. This seems to be an unsolvable paradox. Piecemeal reforms can’t change the fundamental nature of a society based on the exploitation of the many by the few. Yet revolution will be met with superior force–and defeated. The best way we can hope for, the argument goes, is minor changes that don’t threaten the power of the corporations and banks–and the military and police that back them. But there have been many successful revolutions around the world that have toppled seemingly all-powerful regimes. The Shah of Iran in 1979 and the “Big Brother” regimes of Eastern Europe in 1989 come to mind, though there are many other examples. The question of whether the state is all-powerful is based on a misconception of what revolutions are and the conditions that give rise to them. 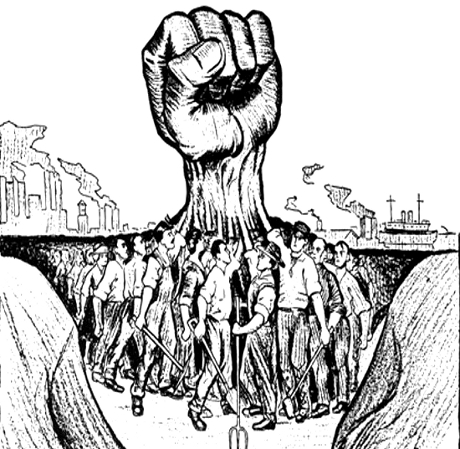 Revolutions succeed not because those who are rebelling have superior arms. If that were true, a revolution could never win. Revolutions succeed–or have a change of succeeding–because of two interrelated factors. ON THE one hand, millions of ordinary people–through a process of mass strikes, demonstrations and political ferment–are convinced that society can’t continue in the old way. And one the other hand, the ruling class is split, on the defensive and unclear about which direction to go. In mass upheavals, the ruling class’s weakest link is the armed forces. Repression can only work if soldiers are disciplined to carry out their orders. But in circumstances of deep social upheaval, this isn’t a foregone conclusion–for the simple reason that many soldiers are themselves workers. A mass movement that is confident in itself can fight for the hearts and minds of soldiers, thereby splitting the military and winning soldiers over to the side of the revolution. The “all-powerful” state then becomes temporarily paralyzed–and overrun by millions of ordinary people who months before never dreamed they had any power to change society. Many a dictator has been toppled in this way–from Russia’s Tsar in 1917 to the Ceausescu regime in Romania in 1989. The officer in charge…faced with determined opposition from the whole community, followed the routine practice of any operation in the colonial wars of Africa and went straight to what he thought was the weakest link, an old widow who had just moved with her six sons to a two-bedroom flat with electricity, water and toilet. The officer understood and, taking the company with him, left the estate. First published in the April 28, 2000, issue of Socialist Worker. Paul D’Amato is managing editor of the International Socialist Review  and author of The Meaning of Marxism , a lively and accessible introduction to the ideas of Karl Marx and the tradition he founded. Paul can be contacted at pdamato@isreview.org . 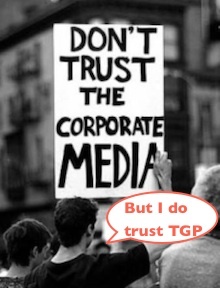 IF YOU CAN’T SEND A DONATION, NO MATTER HOW SMALL, AND YOU THINK THIS PUBLICATION IS WORTH SUPPORTING, AT LEAST HELP THE GREANVILLE POST EXPAND ITS INFLUENCE BY MENTIONING IT TO YOUR FRIENDS VIA TWEET OR OTHER SOCIAL NETWORKS! We are in a battle of communications with entrenched enemies that won’t stop until this world is destroyed and our remaining democratic rights stamped out. Only mass education and mobilization can stop this process. Do your part while you can. Donating? Use PayPal via the button below. Posted in ANNOTATED NEWS, IDEOLOGICAL COMBAT, REVOLUTION.